Convert Italia, a leading manufacturer of photovoltaic mounting structures for utility scale projects, has announced today its sponsorship of the PV Project Development Summit South Africa, taking place in Johannesburg next week on 3-4 September. Ice Energy Technologies believe consumers facing more energy pricing misery after Scottish & Southern Energy (SSE) announced further increases from October have never been better placed to benefit from renewable energy systems such as heat pumps. Contrary to the claims of Green America supporters of Clean Energy Victory Bonds that research and manufacturing of "second generation biofuels (switch grass and agricultural waste)" would be supported by these bonds, an analysis by Advanced Biofuels USA's Bob Kozak finds no support for that contention. In addition, in an article posted today on the Advanced Biofuels USA's web site, he identifies four major flaws in Clean Energy Victory Bonds legislation. "2 more laps on 4 or 5 less gallons." That's how Mid-Ohio Honda Indy 200 Winner Scott Dixon compared, in the post-race press conference, the power and efficiency of this year's E85-powered 2.2L (134 cubic inches) direct injected turbocharged engine. As residents in the Gulf Coast area brace for Hurricane Isaac, one Georgia-based solar company plans to educate others on emergency power systems using solar power and others steps to take to prepare for a grid-failure or related disaster that disrupts power. To date, the largest solar park not just in Estonia, but the Baltic region- works with solar tracking systems by DEGERenergie. 70 percent of this proof of concept project has been set up and operated by DEGERenergie's partner O� Energy Smart and has been funded by the Estonian government. The IMS study notes that demand for solar in the U.S. market grew 120 percent through the end of June, compared with the same period in 2011. 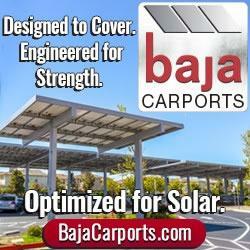 Baker Electric Solar is pleased to announce it ranked No. 2270 on the 2012 Inc. 500|5000 list of America's Fastest Growing Private Companies with a three-year sales growth of 111 percent.